I saw this reusable kitchen roll tutorial right when I first started sewing. I thought it was amazing and vowed to make it. That was a good few years ago now and I still haven't gotten round to it but I found the tutorial again on Pintrest last week. To see the tutorial go and check out Sew A Straight Line. She has tons of cool ideas on there! I pinned this one a while back. 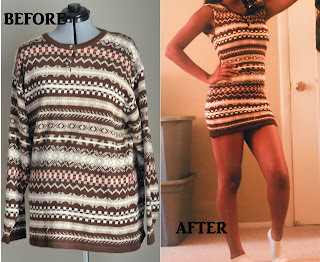 Nichelle does Refashion Co-op aswell so I first saw it on there. I think it's really cute, even if it didn't turn out as she had planned. Go and check out her blog, It's Nichelle not Michelle. 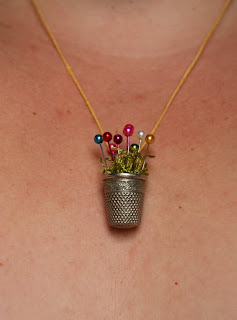 What about this gorgeous thimble necklace I found at The Wind and The Sail. Absolutely brilliant idea. If I wasn't scared of drills, I'd definitely be making one. Might have to get Paul to drill a tiny hole in a thimble for me hehe. Oh I'm so going to try this out in our back garden. We have chalks which Leyla loves to use but this would be even more fun I think! And it just washes up again. Easy peasy! That's my kind of craft :) The recipe for the sidewalk paint can be found at Oh Dee Doh. Feel free to grab my featured button from the sidebar if I have linked to you.